Chef Emily Moore scrapes chopped chiles into a blender, along with toasted spices, garlic and shallots, lemongrass, ginger, galangal and lime to make Thai red curry paste last week at Hidden Valley High School’s kitchen classroom. Tasteful Thai was the first gourmet cooking class Moore, and her husband Mark Solomon offered through Rogue Community College. Though the rest of this term’s classes are full, four sessions will be offered during the summer. A rich, pungent, aroma wafts through the classroom kitchen at Hidden Valley High School as chef Emily Moore stirs chopped garlic and shallots in a hot wok. 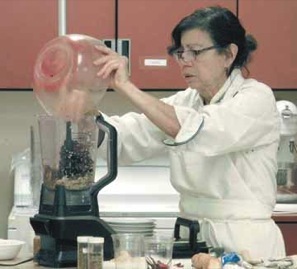 Moore adds the garlic and shallots to a blender, already holding dry-roasted coriander and cumin. Next she adds chopped chiles that have been soaking in water, dry-roasted shrimp paste, chopped lemongrass, ginger, galangal — a cousin of ginger — and lime peel. She blends it all together — adding a little water to thin it out a bit — and ends up with a fragrant batch of Thai red curry paste. Moore is leading a class on the basics of Thai cooking. It’s the first in a series of four culinary classes that she and her husband Mark Solomon — both new to the Applegate Valley nine months ago — are now offering through Rogue Community College Community Education. The other three classes are French cooking, soft cheeses and appetizers. Trained at a prestigious culinary academy in Paris, Moore has served as executive chef at fine dining restaurants and hotels in Seattle, Portland, La Jolla, Calif. and Sun Valley, Idaho. She has taught cuisine at the college level, most recently for four years at Le Cordon Bleu College of Culinary Arts in Seattle. Thai cuisine also uses many preserved seafood ingredients, including shrimp paste, dried shrimp, oyster sauce and fermented fish sauce. After she demonstrates making the red curry paste, Moore sets the students loose in the school’s kitchens — four students in each of the three stations — for some hands-on time using authentic recipes that Moore has adjusted for American tastes. The folks at Station One are making coconut ice cream, with kernels of fresh sweet corn and garnished with mango, along with a spicy chicken soup flavored with coconut milk, lemongrass, shiitake mushrooms, Thai chiles and cilantro. They are using coconut cream rather than coconut milk, Moore explains, because the cream is richer, thicker. “But you have to be delicate with it. Overheat it and it will separate,” she says. The students at Station Two are making a green papaya salad and crispy fish with red curry sauce. The crispy fish recipe can use cod, rockfish or halibut. The key to getting the fish crispy is dredging it in cornstarch before deep frying in a hot oil. Here the red curry paste Moore made earlier is blended with coconut milk, fish sauce, sugar and dried shrimp ground into a powder to make a creamy sauce served over the fish, then garnished with sliced cucumbers. Station Three is making jasmine rice in a rice cooker, and kale with crispy pork. Although it is somewhat difficult to purchase authentic Thai ingredients in Southern Oregon, Moore says she found everything she needed at an Asian grocery market on Barnett Road in Medford, next to WinCo. Reach reporter Kathleen Alaks at 541-474-3815 or kalaks@thedailycourier.com. 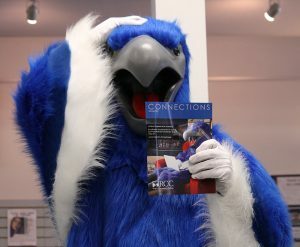 REGISTRATION: Register online at roguecc.edu/communityed starting May 27 or by calling 541-956-7303 starting May 30.